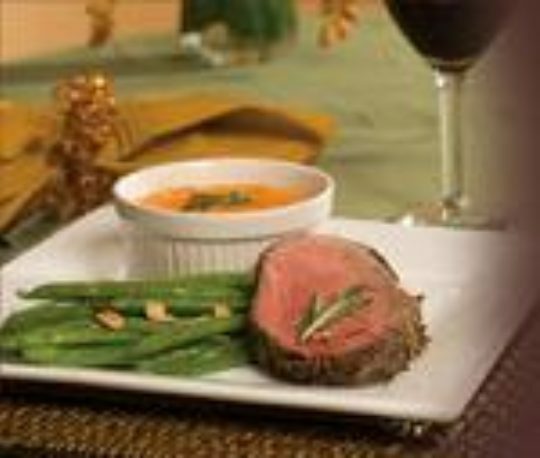 Based on a classic dish, this beef tenderloin will be a hit at your next gathering. With brandy mixed with a variety of herbs, the meat will have a wonderful new taste. Serve with a side of your favorite vegetables for a real treat. Place the dry ingredients for the marinade in a food processor. With the motor running, slowly pour the red wine, brandy and olive oil in through the feed tube. Process until well combined, about 1 to 2 minutes. Pat the marinade over the fillet, making a thin layer over the entire roast. Wrap in plastic wrap and refrigerate at least 6 hours and up to 24 hours. Preheat the oven to 450° F (230° C, Gas Mark 8). Unwrap the fillet and coat it with cooking spray. Roast until meat thermometer registers 125° F (52° C) in the center of the meat for rare, about 30 to 35 minutes. Allow the roast to rest for 10 minutes before slicing. Serve immediately. Baker’s Tip: If you have guests who prefer their meat well done, cut off steaks of meat from the thin end of the roast. They will roast quicker and be ready after the rare meat has rested.